It’s that time of the year again when we take a look back to see what we achieved, what worked well, and what we can do better in the future. At RazorSocial, that means diving deep into our analytics to see which articles were popular with our readers and why, as well as finding those that underperformed so we can improve them. Here we’ll focus on 10 articles that people viewed and shared the most. These are the posts that, according to our audience, delivered the most value and earned a lot of engagement as a result. Many posts in this list are our long-form pieces (1.5k words at a minimum), meaning that readers set aside time to read them. The most shared articles on the list feature tips/commentary from influencers and industry experts. People love reading about marketing tools! Our job is to feel the pulse of our readers and provide them with the content they are asking for – year after year – and hopefully continue to be helpful, inspiring and interesting. So, here’s a look back at what our readers kept clicking and sharing in 2017. For those of you who are new to RazorSocial, this list could be a great place to start exploring the content on our blog. Click on the titles to read the articles in full! I wasn’t at all surprised to see this article rise at the top as the most read piece on our blog in 2017. Why? Because podcasting was (and still is) all the rage and people who are interested in starting their own podcast rarely know everything about the tools and technology they need. Not to mention that we reached out to some of the top podcasters we know and asked them what tools, apps and equipment they use for podcasting. You can expect great performance from an article that features advice from 45 influencers! So, this post was read 24.000 times and shared 3.3k times. I’d say that’s pretty good! This is one of our cornerstone content pieces, a guide on social media analytics that helps people understand what they need to monitor and measure across social media channels. We also provide an extensive list of social media analytics tools with an explanation of main features and the way the tools work. With 5.7K shares, this article proves that long-form content that packs a lot of valuable information around a particular topic tends to perform quite well! Majority of our readers are marketers and business owners, people who use LinkedIn on a regular basis to promote their business, network, and find leads. But…unlike other social networks, LinkedIn doesn’t support a lot of third party tools that make these activities easier and more efficient for its users. We reached out to LinkedIn expert Viveka von Rosen, to ask her about the tools she uses daily to maximize the results she gets from LinkedIn. This article got 10k views was shared an impressive 4 thousand times! We test a lot of marketing tools at RazorSocial, and we decided to share a list of tools we use on a regular basis. We gave our readers a glimpse into our well-equipped toolbox, and they seemed to love the recommendations we offered. This article provides a list of tried and tested marketing technology tools and tactics that anyone can immediately implement in their business. It’s a long list of incredibly useful tips divided into categories, including social media, marketing automation, web analytics, CRO, content marketing, ecommerce, video marketing, and more. Our readers loved how actionable these tips are and shared the article 3.1k times! Content marketing is now a predominant force in the world of business. It helps companies build an engaged audience, improve brand reputation, and increase leads and sales. However, many marketers still don’t have a documented content marketing plan in place and they struggle to find the right technology to help them maximize their efforts. This article lists the top content marketing tools to help people publish and promote great content without spending all their time managing the process. We’ve obviously hit the right note with this one since it was shared 3.4k times! Influencer marketing is becoming an increasingly important part of an overall marketing strategy both for big brands and small startups looking to expand the reach of their message among relevant audiences. I wrote this post to answer the question I was hearing a lot – how do you find relevant influencers on social media? I focused on Twitter and all the useful tools that can help people find the key influencers in their industry on Twitter. This post got 2.8K shares and over 10K views! Finding, curating, and sharing valuable content takes a lot of time. I know this pretty well so I decided to publish a list of useful content creation tools that I use on a regular basis. The goal was to suggest some of the best tools out there to help our readers save time and effort finding great content. This post got 1.9k social media shares! I’ve heard this so many times – people share links to their content across social media channels but they are not able to attribute the traffic they are getting to a specific link. This article explains how link tracking works and how it can be used to track any link and the associated traffic. And, of course, we list out the tools that top marketers use to track the success of their campaigns with precision. Our readers shared this one 1.4k times! If you participated in a Twitter chat before, you know how difficult it can be to follow conversations through Twitter. Chats can be very active, with a lot of people participating and a many new tweets coming in every second. This article lists the best tools you can use to make this process easier and much more enjoyable and it got 1.1k shares! 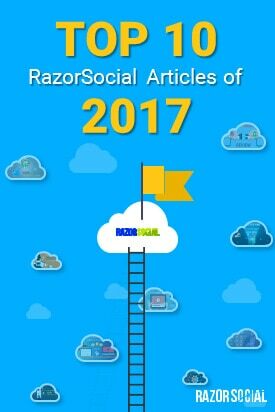 There you have it, RazorSocial’s top articles in 2017! Do let us know if you think there’s something we should be doing better next year, or if there are topics you like to see covered on our blog.